The smartphone has become an indispensable part of our lives so much so, that it is often the first thing we check as soon as we get up in the morning, and also the last thing at night! Noone could have ever predicted how much our lives would revolve around this tiny gadget. A report by Statista says that at present there are 2.1 billion mobile users and in 2019, the number of mobile users is expected to cross the 5 billion mark. It is also to be noted that according to the comScore Future Digital Report 2018, 80-90% of mobile time is spent on mobile apps rather than websites. Smartphones, therefore, have generated their own ecosystem which is very different from those of computers and laptops. There is huge growth foreseen in the mobile app development space. 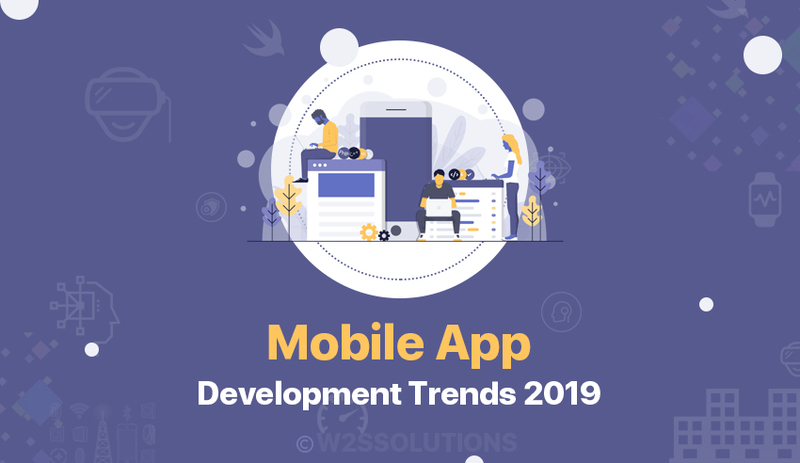 In this article, we take a look at some mobile app development trends that will dominate the market in 2019. Mobile apps offer a very user-friendly, responsive and intuitive way of browsing. Mobile app designers lay emphasis on the UI-UX aspects of design, and it is expected that this trend will grow stronger in 2019 especially in the retail mobile app market. While earlier it was just the larger players like Amazon, Alibaba and Flipkart who used mobile apps to advantage for retail sales, now even the smaller players in fields like food delivery, laundry services, tailoring and a host of other service providers have their own apps custom-created and are reaping the benefits of entering this growing market. There is huge potential for developers who are trying to enter this space. Studies show that the number of m-commerce transactions can easily surpass the number of e-commerce transactions in 2019. So, as a mobile app developer, focus on learning all there is to know about apps around m-commerce. Additionally, it is to be noted that online payments through mobile are increasing rapidly, and Google pay and Apple pay apps are leading players in this fast-developing space. M-commerce is expected to be a guiding force in all app development environments. As consumers get more used to making payments online, mobile payment gateways will also come to the forefront. To be successful, mobile apps must offer several payment options like credit or debit cards, mobile wallets, gift cards, etc. and perhaps even cryptocurrencies in the near future. If you have good knowledge of all these technologies, you can get ahead as a developer. Forecasts from CCS Insights indicate that the number of wearable devices is set for huge expansion, possibly tripling from 84 million units in 2015 to 245 million units in 2019. This translates to a whopping worth of USD 33 billion by the end of 2019. Smart watches, fitness trackers or wearable headsets are all paired with the corresponding apps on smartphones. This has created a whole new market with more devices set to be launched soon. The entertainment, gaming and architectural/product design industries have made great forays into the world of Augmented Reality and Virtual Reality, with many revolutionary apps being created in this segment. New possibilities in the world of real estate, health and engineering are also being explored to leverage the marketing potential that can be unlocked using AR and VR. For example, Interior design companies use an interactive VR app to show clients how their chosen interior design modules will look within their own homes. Based on their specifications, customers can see a preview of their selected designs and will be able to judge how the finished interior will look. Human body simulation for medical students, space simulation for astronauts, and so on will also become very popular. Gartner reports that the use of AI across platforms will increase multifold. All of us are already used to Siri, Cortana, Alexa and Google assistant running our lives for us….they play music, tell us the weather conditions, help us navigate our way across town and remind us to prep for meetings! Their AI capabilities will increase, and chatbots and personal assistants will take over even more than they are doing now. As a developer you will do well to learn more about this latest app trend. A happening trend in mobile application development in 2019 is going to be cloud integration for mobile applications, ensuring a seamless experience for the users. This will especially work well for virtual training companies as their users can access resources from wherever they are, at any time they need to do so. Dropbox, Evernote, Google notes and so on are apps that help professionals to access their personal as well as professional data anytime from anywhere. With security and privacy issues in these apps now being sorted out, their usage will become more prevalent. Mobile app companies must address all security issues if they want to retain the trust of users everywhere. Private data must be kept secure, and hackers should be kept at bay. Data breaches have become all too common in recent times, and users are apprehensive about the ways in which their data could be misused. In order to succeed, mobile apps need to factor in high degrees of safety to assure end-users that you have taken care of their security concerns. The Internet of Things (IoT) is also expected to be a hot and happening space in the foreseeable future. IoT involves many smart devices such as trackers, card readers, and so on, that have special circuits, sensors and software built into them, and can be connected to mobile apps. Today, smart supply chains, IoT enabled homes and smart healthcare are very much a growing reality and the demand for feature rich mobile apps is on the increase. To conclude, mobile app developers are in for some exciting times ahead! Do keep yourself well apprised about all these new-age innovations in the industry, and you can stay ahead of the competition! Emerging Trends in the Software World!